Being half Hungarian from my dad's side and having my grandparents close by, I grew up on plenty of stick to your bones meat and potato Eastern European food. I am thankful for that in many ways. Being fortunate enough to visit Hungary on two separate occasions and both times having goulash a part of that trip — I knew this was one dish I must learn. On the open flame outdoors with the preparation in the morning taking a couple of hours and the actual cooking time taking up most of the afternoon, I always know the season has turned cooler when we prepare to make this dish stateside. 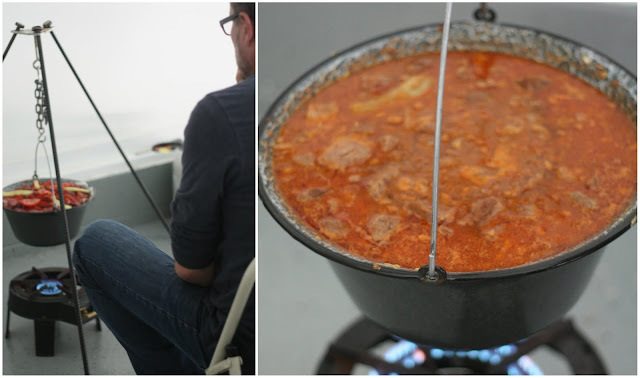 Borrowing the historical information from another Hungarian (The Hungarian Girl), Goulash has a very fascinating story dating back as far as 896 A.D. 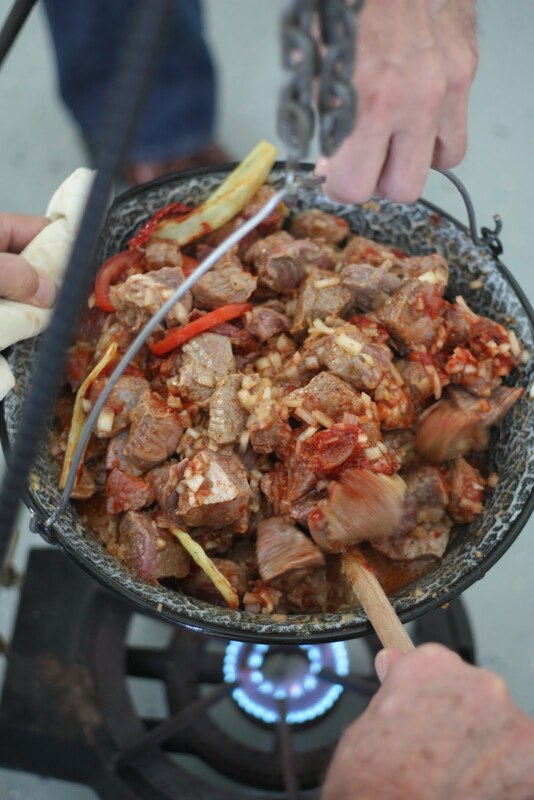 In Hungary, the dish is called “gulyás” meaning cattle stockman or herdsman. It got this name because the herdsman of Hungary often traveled far from home on horseback with their flock of sheep or steers to find better pastures on the Hungarian plains. At nightfall the herdsman’s would build a bonfire, slaughter an animal and then cook it in a large pot hanging over the fire known as a bográc. 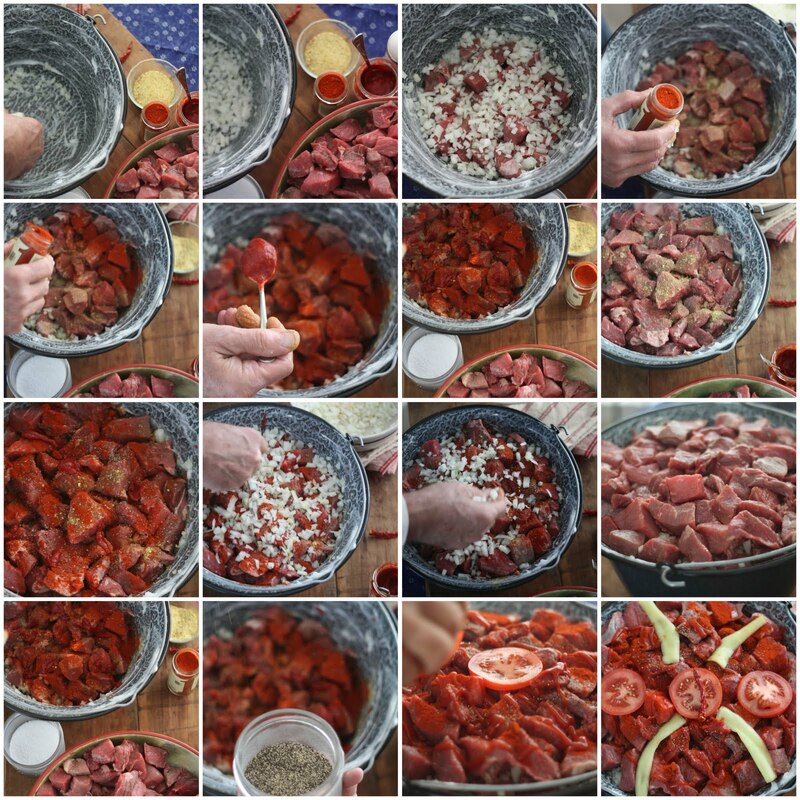 Our version of this dish, as with most, is quite simple and contains lard (this greases the bográc), 7-8 pounds of beef, 3-4 large yellow onions, generous amounts of paprika, tomato paste, black pepper and traditional Hungarian spices (or Mrs. Dash) — all layered in a process over and over again until the pot is full. The tomato and Hungarian banana pepper tops everything off really just for decoration as the bográc is placed over an open flame. As you can see from the video above the lard comes into play as the pan heats up. You want to be able to gently twist the pan which causes the pan to spin freely. This is especially important as to not let the bottom layer of onions burn. Then you wait - 2 1/2 to 3 hours, gently twisting the pot and adjusting the chain. You really want just a slight simmer. Note there was never any liquid added to the dish. Between the onions, meat and the slow cooking — it creates its own broth. So much so, you may have to strain some off during the cooking process as seen above. The orange hue from the paprika creates a flavor you will not soon forget. For this amount of beef (7-8 pounds) it took about 4-4 1/2 hours to go from the raw beef to the goulash consistency above. The cooked meat is then served over Hungarian nokedli (similar to dumplings or pasta) which my grandmother always made from scratch. As opposed to using a metal grater or spatzel tool she would used two spoons to pinch the dough and drop it immediately into boiling water. 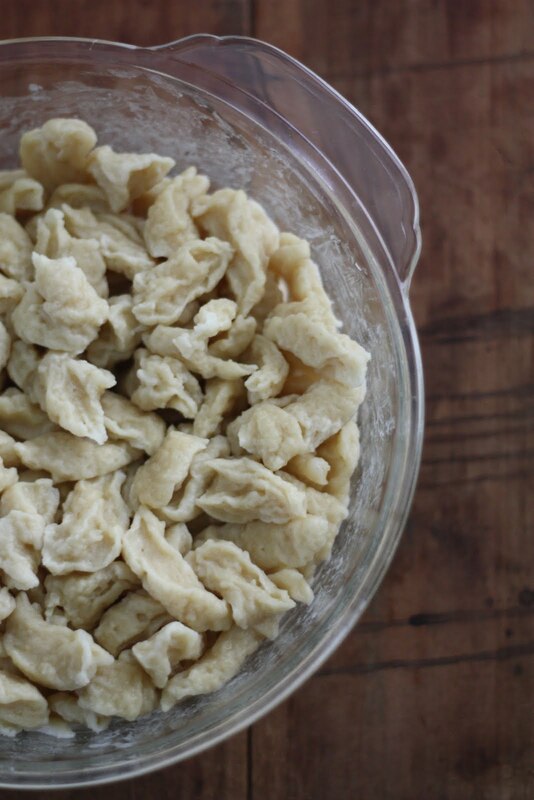 Spoon the goulash over top of the noodles and you can always dollop with sour cream. This one family dish I am thankful I have documented as I want to keep this tradition going forward and passing it down to my children and grandchildren. What dishes are traditional in your household? Have you sat down with your parents and helped create the dish so you can carry on the tradition? That looks so filling and delicious! The way it is cooked reminds me of dutch oven recipes which are quite popular out here in the wild west. What a wonderful recipe and what a fun way to cook it. @Monica we are neighbors (in a sense). So love pierogi's! @Cuisine de Provence it is a day long event but well worth it!